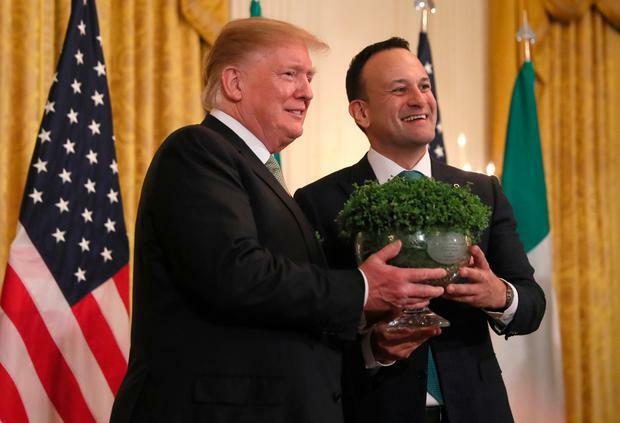 TAOISEACH Leo Varadkar has praised US President Donald Trump for the results of his efforts to ‘Make America Great Again’. He made the remarks during the traditional shamrock ceremony in the White House this evening. Mr Trump was joined by first lady Melania for the event in the East Room of the executive mansion. In his speech Mr Varadkar spoke of achievements by Mr Trump’s predecessors in the Office of President. He said Abraham Lincoln had preserved democracy and Franklin D Roosevelt and Ronald Reagan “defeated two evil empires and secured freedom for the world”. Mr Varadkar said: “Your ambition is to make America Great Again, and I think we can already see some of the results of that”. “The American economy is booming. More jobs. Rising incomes. Exactly what you said you’d do. “However, I believe the greatness of America is about more than economic prowess and military might. “It is rooted in the things that make us love America: above all your people, your values, a new nation conceived in liberty. Mr Varadkar said people around the world have been inspired by America and have traveled to go there and make it their home, including millions from Ireland. He said some people made the opposite journey and still do, and when Americans come to Ireland we greet them as brothers and sisters. Mr Varadkar said he believes that “future generations of our citizens should have the same opportunity to enrich one another’s societies as past generations have”. He said: “No nations at the moment with as many ties as Ireland has to the United States has so few pathways to legal immigration. He thanked Congress and Mr Trump for their support for the new E3 visa programme which will allow a limited number of Irish people to work in the US each year. The scheme is open to Australians but they don’t use the full amount of visas that are open to them. Proposed US legislation would see Irish people eligible to apply under the scheme. Earlier Mr Trump welcomed Mr Varadkar and his partner Dr Matt Barrett to the shamrock ceremony. He said “there’s a lot of Irish folk in this room… Some of you came all the way from the Emerald Isle to be with us. Mr Trump noted the Irish Americans in the room including vice president Mike Pence and Supreme Court Justice Brett Kavanaugh. He went off script to talk about trade with China but later returned to his theme. Previous articleVIDEO: MPs have rejected leaving the EU without a deal – so what happens next? High street stores are collapsing, but Zara is thriving – what’s the secret to its success? VIDEO: MPs have rejected leaving the EU without a deal – so what happens next?